Before the ink dries on the first cardboard sign expressing a fan’s love and devotion, the countdown to a boy band’s inevitable demise has already begun to tick away. As its members age, it’s only a matter of time until their boyish charms fade, at the cost of the zealous audience of young girls essential to their continued existence. But what if idols could remain forever young, with profiles set in stone, chiseled good looks eternal? Such is quite literally the case in Sekko Boys, a delightfully absurd short-format comedy anime from Liden Films, written by Michiko Yokote (Prison School, Shirobako), in which it’s to the top of the pop charts or bust! Gypsum stone busts, to be precise. These aren’t your typical male idols, no siree, as the four handsome Sekko Boys, also known as the Rockies, are all works of art by master sculptors. The “Holy Soldier” and protective leader of the group, Saint Giorgio, one of the most celebrated saints in Christianity, and a supposed dragon slayer to boot, was crafted by the hands of Donatello. Fellow Florentine Michelangelo labored over the visage of Giuliano de’ Medici, of the immensely wealthy and influential Medici family, known for begetting popes, monarchs, and funding the Italian Renaissance, who fills the role of the fresh-faced pretty boy of the Rockies. Then the Sekko Boys bring out the big guns, with a pair of gods—Hermes, the Greek god of trade and travel, to scratch but the surface of his talents, who emits an aura of suave worldliness, as carved by Praxiteles, and Mars, the Roman god of war and bad boy of the Rockies, as passionate about conquering his foes as he is in capturing women’s hearts, based on the Ares Borghese. Wrangling these hardheaded up-and-coming stars is their fledgling manager Miki Ishimoto, a recent art school graduate, who applied to Holbein Entertainment to take her life in a new direction after years of torment from her educators, drilling her endlessly with tedious sculpture sketching exercises, stifling her artistic freedom. Content to never lay eyes on another until her dying day, Miki just about blows her top upon meeting the crew, and it’s a rocky road to fame and fortune from there. 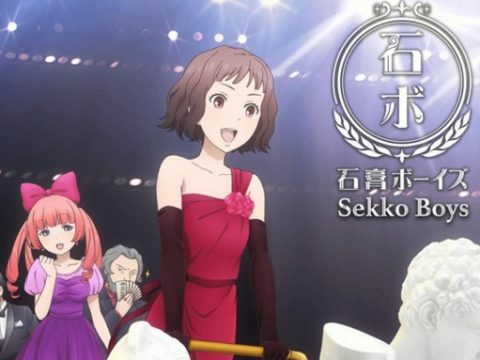 Setting the parodic nature aside, Sekko Boys functions well as an idol anime, showing the ups and downs experienced by performers and their talent agencies, but such an exception need not be made. Though it’s a gag one would expect to grow stale in short order, Sekko Boys is consistently witty, and the localization does a bang-up job of carrying the humor through to English. Those with knowledge of—or fondness for, better yet—art history stand to gain the most, but even if you don’t know a Bernini from a Buonarroti, the outlandish tomfoolery is guaranteed to have you cracking up. Adding to the hilarity, Sekko Boys makes zero attempt to blend its visual styles. Traditional anime designs stand beside the realistic sculptures, and we never actually witness the Rockies in motion, short of tipping over. In spite of this, we are readily made to believe that they live as humans do, even occupying their own apartments, and through clever positioning, angles, lighting, and familiar emotive symbols, such as sweat drops and throbbing veins, the guys are amazingly expressive for unmoving hunks of stone. Top-tier vocal talent also brings the busts to life, but for a pop group, we hear little of their musical abilities, not even their much ballyhooed debut single, “We Are Boys.” We are, however, treated to their infectious earworm of an ending theme, the perfect cherry on top to close out each of the 12 episodes. The only complaint of significance that can be laid against Sekko Boys is that it’s over just too darn quickly. From the ancient world to the anime world, these idols have earned their place in the history books. January 29, 2016Norbert Daniels Jr.